As with other online retailers, photo and products are purchased from a photographer’s site by adding the photos and products to the cart. As the products are being added to the cart, the photos will need to be configured specifically for the selected product. Depending on the product, some product options are offered and these options can be selected as the photos are being added to the cart. Once in the cart, the images can still be configured and product options can be changed. This guide covers how to configure photos for the selected print product and how to choose from the various product options. The Photographer is also able to choose which options are available to their clients. This means that not all options displayed in this guide may be found when ordering from the photographer’s site. Options for multiple photos and products in the cart can be edited at once using the Edit All options. This is especially useful when ordering a large quantity of prints at once. The Edit All options will be vary depending on the types of products in the shopping cart. The Edit All options will apply to all of the products in the same category. 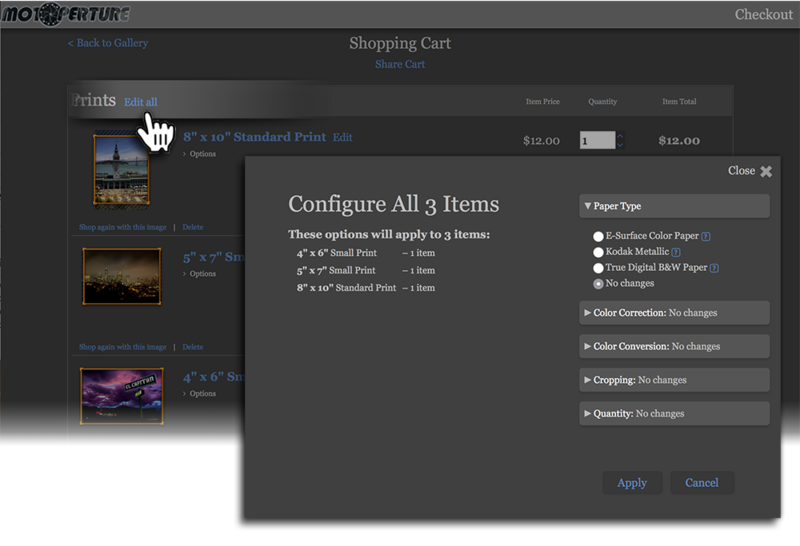 For example, you can use the Edit All options to apply the same settings to all photo print products in the cart then apply a different set of Edit All Options to all Press Products (e.g. Greeting Cards) in the cart. The products affected will be listed in the Configure All Items window that appears when Edit All is clicked. Click Edit all. A pop-up window will load with all available batch options. Paper Type displays the available paper options for all of the products in the same category. Color Correction allows you to request that the lab color correct all of the images in the same product category. This option is not offered by all labs. Color Conversion allows you to choose a color conversion that you would like to apply to all of the images in the same product category. Cropping allows you to apply the same cropping option to the images. The available options are Centered, Fit or No Changes. Quantity allows you to change the number of products being ordered. Once you are satisfied with your selections click Apply. Your changes will immediately be reflected in the shopping cart. Note: Click the [?] icon next to any item for more information. Cropping is often necessary when ordering prints and many photo products, as the desired print size doesn’t always match the aspect ratio of the photograph. For example if you order a 10×10 inch print from a photo that is formatted at 11×14 inches, some of the image would need to be cropped. Think of it as printing a wide rectangular image into a square shaped print. Zenfolio offers a cropping solution built in to the ordering process. Before an order can be completed you will be prompted to confirm cropping. Note: The default cropping setting is Centered. In the Shopping Cart, click on the Thumbnail preview for the image you would like to crop. A pop-up window will load with the cropping options. Click to select the cropping option you are most happy with. Choose from Center or Fit. You can also choose to manually crop the image. Use the Zoom slider to zoom in and out of the image. Click on the image to drag and drop the image into the desired position in the print.Note: Everything inside the red line will be printed, including any white space. Critical parts of the image (such as the head of the subject) must be inside the red line. Click Save or Save and Close. You will be returned to the shopping cart. Repeat for other images if necessary.